We deal in wine surprises around here and of course we generally mean the good ones. Very occasionally, however, we come across a not-so-positive surprise out there in the world of wine. I’m always surprised when I hear an American wine drinker disparage Riesling, for example. A noble varietal renown throughout the world, the Riesling grape can produce absolutely remarkable wine. It’s high in acid (i.e., it’s tart) so Riesling is one of the few white wines that ages well and is able to be made into a number of different styles, too (from bone-dry to dessert-sweet). Rieslings are also tremendous wines for pairing with food because the primary purpose of any drink served with a meal is to cleanse the palate and Riesling can cut through just about any menu you can imagine. Drink it with a thick steak if you want. Seriously. At any rate, if you’re under the impression that Riesling is just cloyingly sweet and gross then let’s set the record straight once and for all. Right here. Right now. I can’t erase your memory of that giant jug of Rhine Wine you shared with friends in college (it’s like liquified SweeTarts). Or your grandma’s Blue Nun, for that matter. But I can introduce you to some incredible Riesling from its traditional home in Germany. 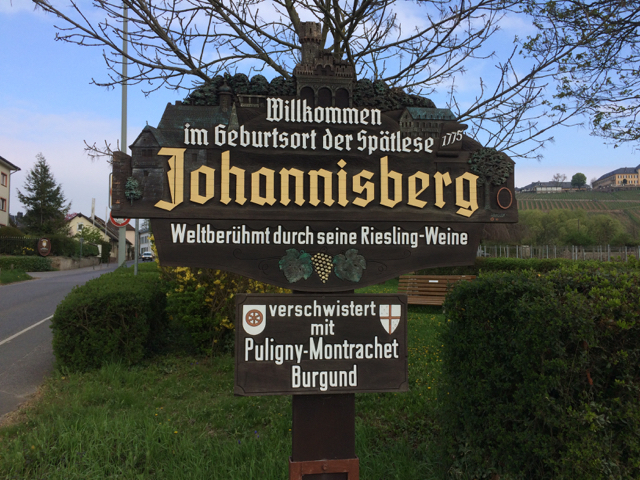 Our first stop will be the quaint village of Johannisberg in the Rheingau region. From there we’ll move on to the Mosel wine district. (Taking note that both areas are named for the rivers that make viticulture possible there.) Please set aside your prejudices and be sure to button up your lederhosen because there’s incredible wine ahead. God bless Grandma. I wonder if she even knew she was getting shorted by 50 ml. Johannisberg is known for its wine as well as its castle (I know, so predictable) but it’s also just a normal, functioning small town. What struck me as surprising as I walked around for a few hours is that wine is an embedded, intertwined aspect of the culture and community. In fact, nearly every otherwise unused square foot of dirt is dedicated to vines. I discovered vineyards in backyards, in churchyards, just beyond school boundaries, and in plots large and small adjacent to cemeteries. Life and wine (meaning the full life-cycle from dirt to dinner) are up-close and intermingled in Johannisberg. Every good story has a castle. Wine producing regions in the new world (e.g., the USA, Australia, and New Zealand) cover vast areas with plenty of space between vineyards, wineries, and dwellings (which are miles, rather than meters, apart). If you’re going to visit those wine regions, you’ll need a car. But in Johannisberg, you can cover quite a bit of ground on foot. 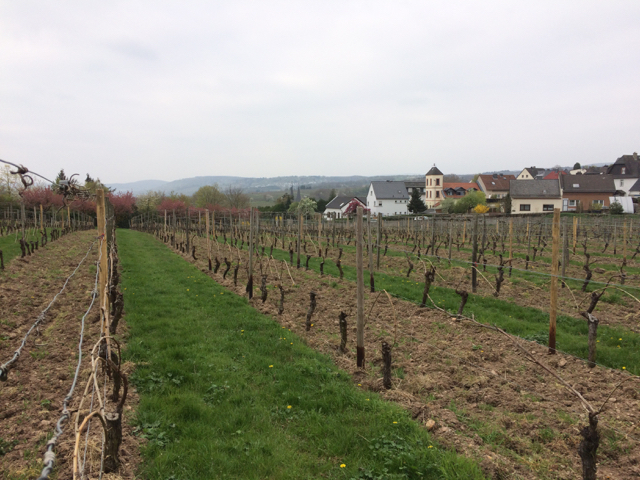 As a partial result of such proximity and familiarity, wine isn’t just a bottle on a shelf in the Rheingau. Wine is an integrated element of daily life for anyone and everyone to enjoy. Lunch in Johannisberg with a Riesling that easily cut through this rich dish. 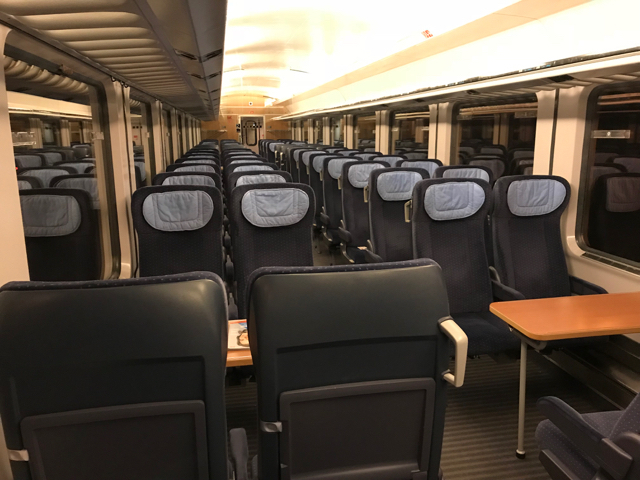 Visiting Johannisberg from my hub in Frankfurt was an easy journey. Traveling to the Mosel region, on the other hand, required more of a personal investment. It’s a 3-hour trip each way by train and exploring locally on foot (as I did) the miles do add up if you want to see multiple villages (as I did). After covering 22 miles on a beautiful early spring day, however, I had nothing to regret. If it were easy, everyone would catch a 5 AM train to go wine tasting. A beautiful morning on the Mosel River. The immediate impression of the Mosel region is the steep hillside vineyards. Sloped, facing hillsides are common in wine growing regions around the world (on either sides of a river, frequently), but the hillside vineyards in the Mosel region are extreme. The vineyards are so steep that almost no work can be performed by machine so the upkeep of the vineyards (not to mention the actual harvest) is highly labor intensive. In addition to the incredibly steep hillsides, it also becomes immediately apparent just how revered Riesling is in the area. In fact, many wineries are actually called “Riesling Winery” (i.e., Riesling Weingut). If any other varietals are made into wine, those are secondary, at best. 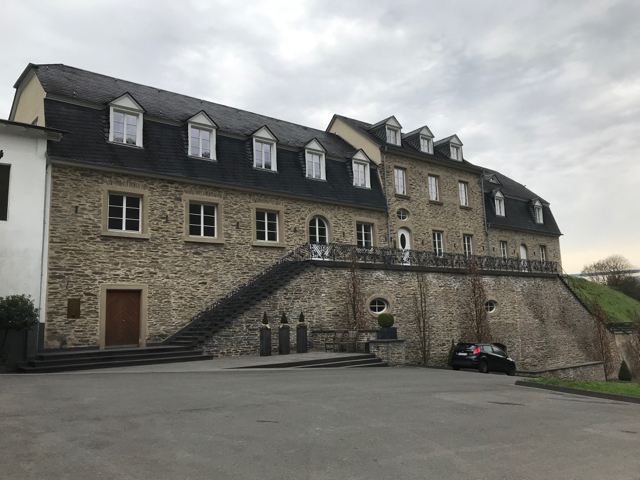 Along with the fetching beauty of the river valley, I also discovered warm and friendly hospitality awaiting me at two exceptional producers–Markus Molitor and Dr. Loosen. Watch your step, it's a quick trip to the bottom. Now THAT'S a back garden. Winemaker Markus Molitor comes from eight generations of wine business experience. His father was also a winemaker and Molitor took over his father’s work in 1984 (the current winery facility actually dates to 1890 but was not part of the family business previously). As a 20- year-old, Molitor already had a vision to recapture the “golden era of Mosel wine” dating prior to WWI. I took note of this because I would actually call Molitor’s wines very modern–clean, powerful, and extremely focused. He is also known for the variety of wine he produces so, fittingly, there were 43 different options to choose from on the day I visited. Twice as many wines are made here each vintage. Germans are nothing if not methodical and exhaustive in their pursuits. There's nothing to distract from the wine in the Markus Molitor tasting room. Though I came for the Riesling, I felt compelled to taste a couple of Pinot Noir wines as well (Pinot Noir comprises only 3% of the wine produced by Molitor). Given the powerful nature of Molitor’s Riesling wines, it was recommended that I begin with Pinot Noir. (Which turned out to be solid advice.) Both were from the 2014 vintage but from different vineyards (in this case Mandelgraben and Klostergarten, respectively). The first was restrained, elegant, and delightfully full of red berry flavors. The second had a bit of earthy quality with more new oak used in the maturation process. It was also pleasantly unobtrusive and included just a dusting of tannins on the gums. These were truly delicious wines so let’s hope to see more Pinot Noir from the Mosel region in the future (the Nazi regime banned non-German varietals in the area and the regulations were not overturned until 1988 so there’s still precious little Pinot Noir planted in the Mosel). The oldest was a Graacher Domprobst Auslese from 2003 and the youngest were from the 2016 vintage (including the 98-point 2016 Zeltinger Sonnenuhr Auslese). Alcohol by volume ranged from 11.5% for the dry Rieslings to 7.5% for the sweet wines. The 2006 Zeltinger Schlossberg Trockenbeerenauslese provided a special experience (at $140 for a half-bottle, I suppose it should) but my favorite was the 2016 Erdener Treppchen Spatlese with notes of peach, yellow apple, and wonderfully prominent acid. At only $24 a bottle, this wine is a value. Molitor uses only native yeasts in winemaking, ages dry wines in large non-toasted barrels (the micro-oxygenation permitted by the vessel contributes a slightly creamy body to the wine) with all off-dry and sweet wines aging in stainless steel only (the sugar provides the improved mouthfeel that a dry Riesling would not exhibit if aged only in stainless steel). Without a doubt, Markus Molitor wines are standout examples of the best of the Mosel region. 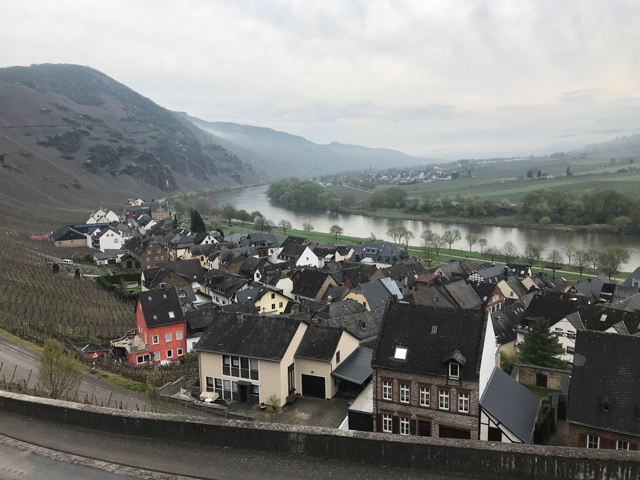 A long, beautiful walk along the Mosel river helped prepare me for the next tasting experience, this time at Weingut Dr. Loosen. German wine classifications are notoriously difficult to understand and recall (even by Germans, I was assured) and Dr. Loosen follows somewhat different production and labeling guidelines as part of the “VDP” (i.e., Verband deutscher Prädikatsweingüter), an invitation-only group of 200 elite German winemakers. I was joined in the previously-arranged private group tasting by a fine wine merchant from London, her German wine-industry colleague, and three congenial Italian gentlemen who were obviously Riesling-fanatics. There are worse places for an amble. Sometimes in life you just know you’ve arrived. 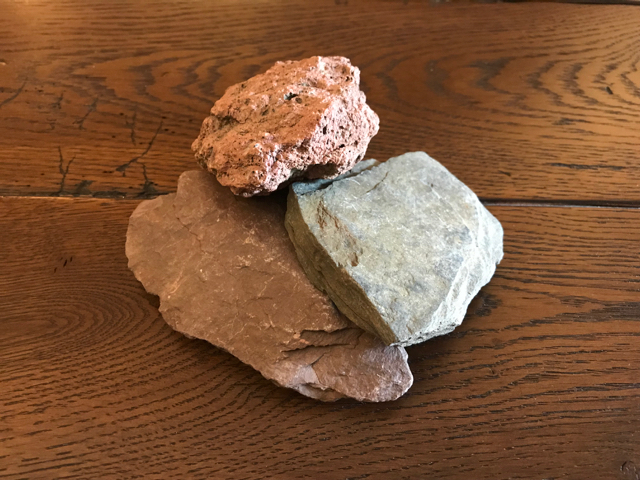 There was much discussion of the region’s blue slate (prominent on one side of the river), red slate (on the other side of the river), and red volcanic soils (found only in rare cases such as the famously steep Ürziger Würzgarten vineyard). The type of soil impacts the character of each wine, but it’s perhaps most important to note that the slate helps ripen the grapes in this very cool region by reflecting the sun back up to the vines and by holding (and then releasing) the heat of the day’s sun through the cool evenings. The warmth of the river itself as well as the very steep vineyard slopes facing south also make it possible to grow grapes in this otherwise unlikely vineyard region. 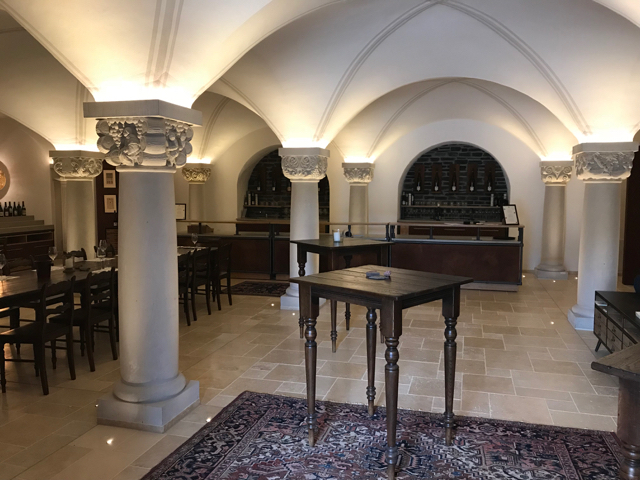 The newly-completed tasting room at Dr. Loosen (pronounced "LOW-zen"). Visiting Dr. Loosen is an education in soil types. So precious, it's delivered in a 1/4 bottle. The 8 wines on pour at Dr. Loosen varied from dry expressions of Riesling at 12.5% alcohol to very sweet Rieslings at 7.5% alcohol. Overall, various citrus flavors stood out in the midst of the many food-friendly wines in the line up. 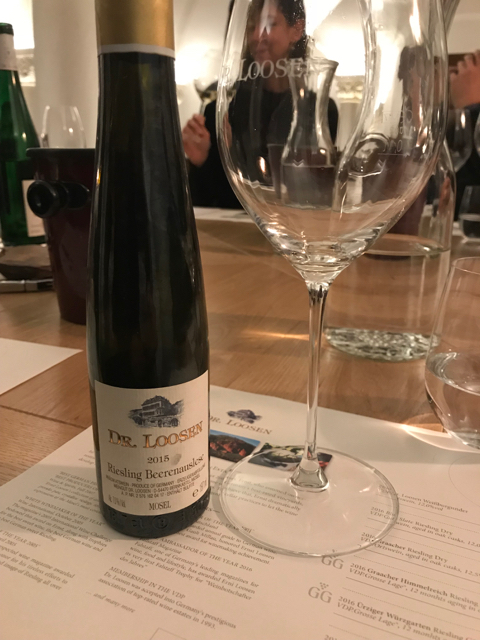 The final wine, a 2015 Beerenauslese, was poured from a half of a half of a bottle (i.e., 187.5ml) made exclusively for Dr. Loosen by an Italian bottle manufacturer. A true rarity in every way. As beautiful as these wines are, it was the story of how (even rarer) Ice Wine is made at Dr. Loosen which perhaps provided the most poignant moment of the day for me. As mentioned, area vineyards are ridiculously steep around here and therefore highly difficult to pick. Each year about 50 vineyard workers arrive from Poland, Hungary, and Romania for the month of October. The late-harvested grapes for Ice Wine are not available every year (weather conditions have to be just right) so pickers return to their home countries before it turns cold enough to know if the late harvest will be possible (temperatures must descend to 20 degrees Fahrenheit early enough that the remaining grapes have not completely rotted on the vines). With no labor available so late in the season, what’s a winemaker to do? Well, in the lucky years when all weather factors align, the 60 regular employees of Dr. Loosen rise to the occasion. Everyone is alerted by text in the middle of the night to arrive at the vineyard by 4AM. This includes sales administrators, marketers, the HR department, the finance team, and anyone (and everyone) else who is employed at Dr. Loosen. Colleagues endure the freezing, nearly-perpendicular work on top of sharp rocks for 5 hours together before the sun rises and ruins everything. Then co-workers gather for a simple breakfast (with Riesling, of course) before going home for the day. As corporate team building exercises go, a day at the ropes course pales in comparison. Lang lebe Riesling! The famous (and famously steep) Ürziger Würzgarten vineyard. If we had to work an honest day in these vineyards we'd also want a place to sit down and pray (or possibly die). We wondered about these vineyard signs. But we suppose all cultures advertise what they value most. We'll drink Riesling with anything. Or nothing at all. And we love a good wine surprise. Have one to share? Email us! We have absolutely no idea what's going on here. Free wine for anyone who can tell us.